I promised you a recipe utilizing the Thai peanut butter we made the other day. I’ve been enjoying just eating the peanut butter by the spoonful but I wanted to find a way to enjoy it in some of my favorite recipes. 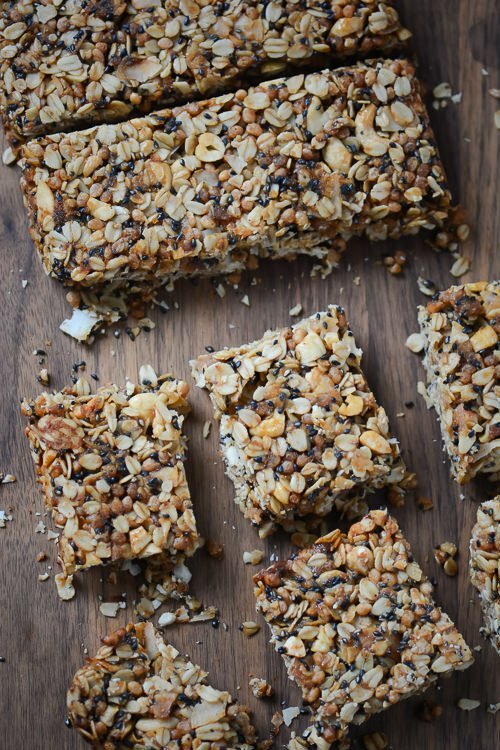 We like to keep homemade granola bars around instead of always turning to packaged protein bars. It’s easier to control the amount of sugar and you don’t need to rely on any artificial ingredients. The bars aren’t too sweet and get a nice kick from the lemongrass, ginger and sriracha in the peanut butter. They’ll keep for 5-6 days in a covered container. 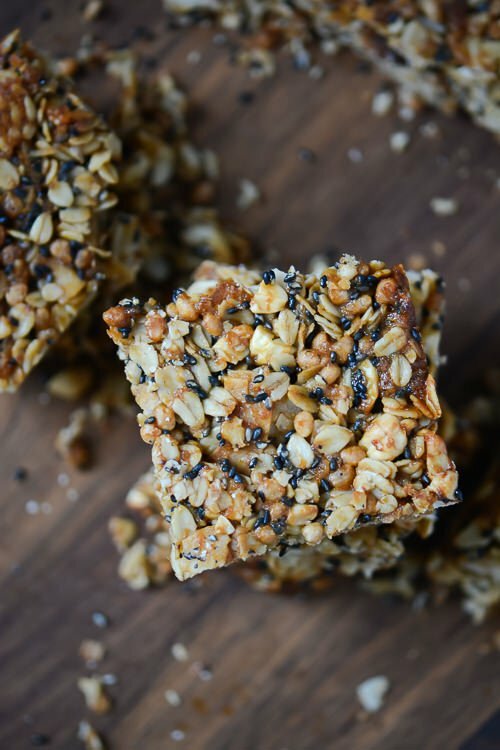 These unique granola bars are loaded with Thai spices, coconut, cashews and sesame seeds. In a medium skillet melt the coconut oil over medium heat and add the oats. Cook over medium heat stirring occasionally until the oats start to turn golden brown 5-6 minutes. Transfer the oats to a medium mixing bowl. Add the crispy rice cereal, sesame seeds, cashews and coconut to the oats. In a small saucepan add the coconut milk, honey, peanut butter, lime juice and salt and cook over medium heat, stirring constantly until the mixture comes to a boil. Pour the syrup over the oats and using a spatula make sure that all the ingredients are evenly coated. Spread the mixture into the prepared pan and bake the bars for 20 to 25 minutes until the bars are golden brown. Let them cool completely, slice into 12 portions and serve. Oops, sorry about that. I used 1/2 cup of roasted cashews in the recipe. I’ve updated the ingredients so it should be good to go! 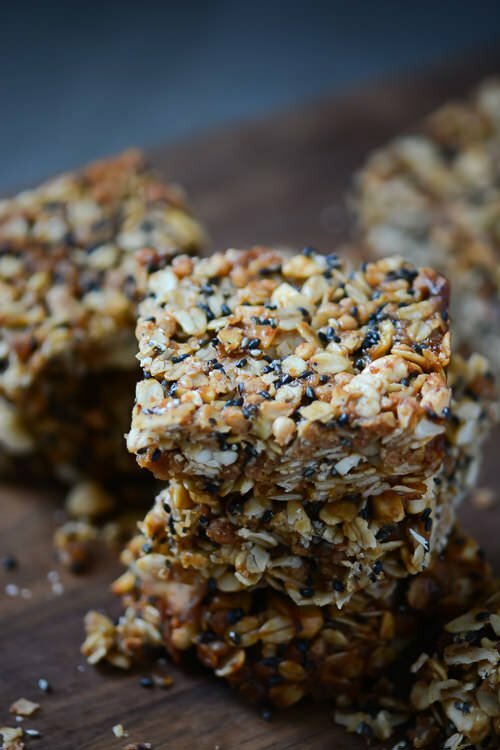 Oh my god, I’m shuffling back and forth between the Thai peanut butter and these granola bars — it all sounds amazing, don’t know where to start! I’ve been eating the peanut butter by the spoonful but if you don’t want to make the peanut butter you could just infuse the coconut milk with all the add-ins from the peanut butter and use whatever peanut butter you have on hand! Wow, these granola bars sound so different and interesting! 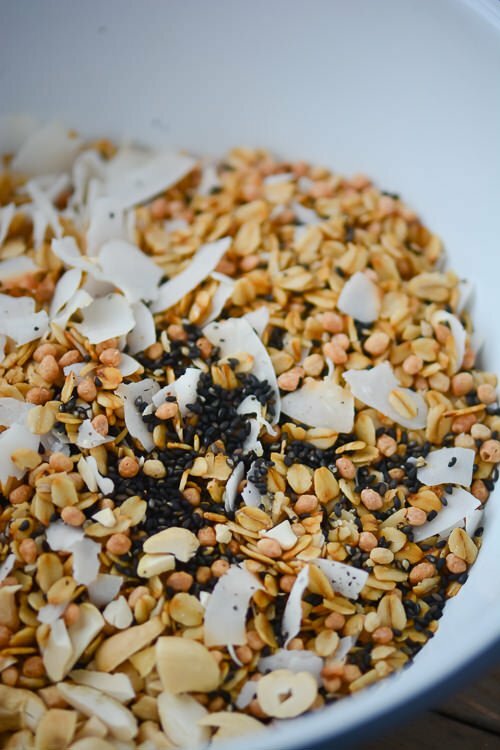 I love the idea of adding in black sesame seeds–pretty and delicious. I just thought they would add a little something with the flavors I have going and they provide some added protein as well. We’ve been enjoying them as afternoon snacks!